I have not given any time to the 'build' over the last few weeks but I don't want this stopping me from updating this blog! That's why I'm stepping back in time to make mention of where the Candy Rocket Specials really started. 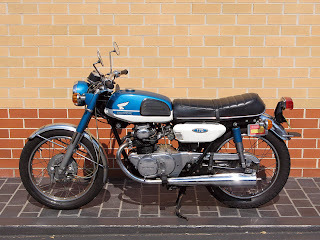 This was the first project, a 1969 Honda CB175 K3. I purchased the bike about eight years ago and even though the bike was not running, and required some serious mechanical repair, it does still carry its original Candy Blue/Green paint. How could I not name her Candy? The only modification is the replacement of the handlebars which now have a one inch rise instead of the original four inches. All damaged or lost parts on the bike where replaced with new-old-stock factory parts. The intention from the very beginning was to modify the bike and turn it into a nimble little cafe racer but it became to precious and I ended up restoring her instead.